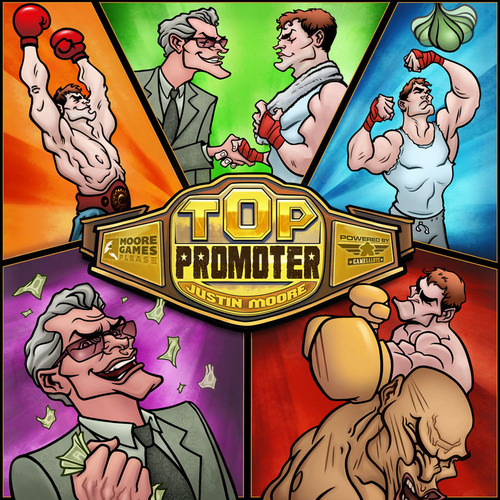 Today we’re taking a look at Top Promoter, a card and dice game that takes place in the world of competitive boxing. The game is designed for 2-5 players, and plays fairly quickly. Bouts are resolved by rolling dice. 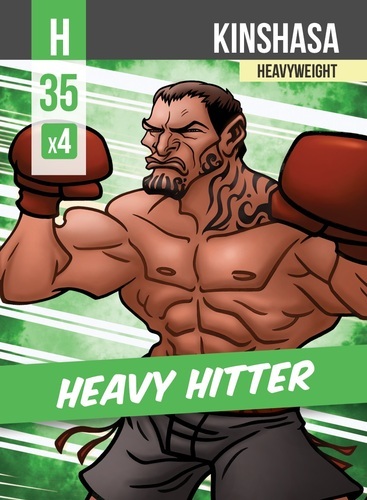 Each boxer has a dice value printed on their card indicating how many dice you roll for them, and if that boxer is capable of a knock out. 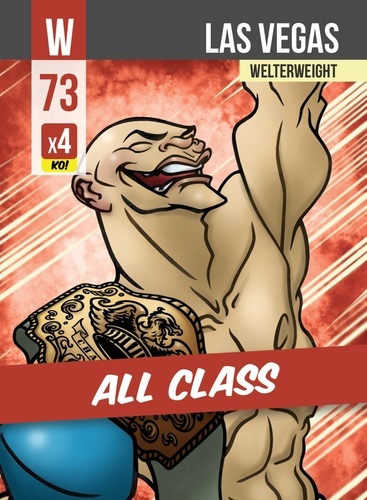 If they’re able to KO a boxer, there are three different rolls that will accomplish that. A boxer with a 3 on his card needs to roll three-of-a-kind, a boxer with a 4 needs to roll a straight, and a 5 requires a full house roll. Players take the appropriate amount of dice and roll them, then compare highest to highest. If one player rolls a 5 as their highest and the other rolls a 3 as their highest, that’s it: The fight is over and the player who rolled a 5 wins. If there is a tie you go to the next highest and compare, and so on. Jeremiah—We can’t really comment on the components for the game, since we were playing prototypes with tiddly-winks for money, and generic dice. I will say that the artwork in the form that we saw it in was nice, bright and colorful, and I enjoyed the cartoonish nature of it! Firestone—Yeah, that was definitely the best part. You really had to think about when to play your special cards, because the moment a location was full, it was “scored,” so you had to try and figure out if a location would score and you should play that card now or risk another go-around when you might be able to get yourself in an even better position to utilize a card. Jeremiah—The bouts are where the whole thing fell apart for me. I don’t mind dice AT ALL; I love dice, I own a lot of dice. But the bout mechanic is just too shallow for me. I can’t get over the Risk-like feel of it. It doesn’t matter what you do or how you jockey for position, you get, one, single, solitary roll to try and roll the highest number. Ugh. Yahtzee even gives you 2 re-rolls. Firestone—Dice-disliker here… But even so, I like games that do interesting things with dice. THIS DOESN’T DO THAT. All that maneuvering and it comes down to one dice roll?! Aaargh! And there are ways to get more dice for your big rolls, but no way to change them or affect them in any way. So even if I manage to roll six dice to your two, if you roll a 6 and I roll all 5’s, I LOSE! I understand that’s kinda thematic, as sometimes the underdog does beat the big dog (Buster Douglas! ), but…ugh. Jeremiah Final Thoughts—I’m holding out hope that there will be an expansion that will add cards that allow you to tweak the dice, or alter them in some way that will make the bouts a little less of a flip of the coin. Time will tell. I have to say that until they do come up with some expansion or fix, Keep This On the Shelf. Firestone Final Thoughts—There was some potential here, but it’s been wasted with a terrible, terrible bout-resolution mechanism. I agree with Jeremiah: Keep This On the Shelf. Thanks for reading, and feel free to watch the video review below. Have a great weekend!